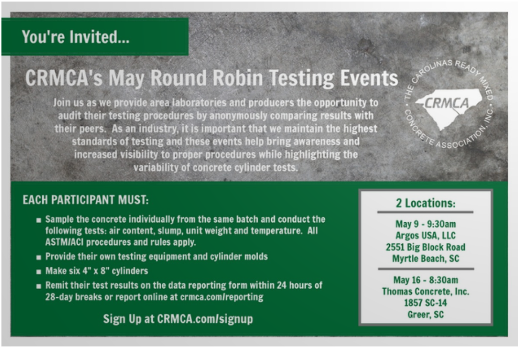 Thank you for your interest in the upcoming CRMCA May Round Robin Testing Events. We hope you’ll make plans to join us in Myrtle Beach, SC or Greer, SC as we provide area laboratories and producers the opportunity to audit their testing procedures by anonymously comparing results with their peers. As an industry it is important that we maintain the highest standards of testing and these events help bring awareness and increased visibility to proper procedure while highlighting the variability of concrete cylinder tests. As a reminder, there is no charge to participate and the events are open to all laboratories and producers in the Carolinas. Please select your location on the Sign Up Form below (you may select both if interested). Once you complete the sign up form you will receive a confirmation email with details and information pertaining to your selected date(s) and location(s). We look forward to a great event and an exciting Networking Luncheon in May where the results will be shared!